I was born in Busdi, and grew up here in Bendum since my mother died when I was only three years old. I grew up with my aunt, Erlinda Menaling. She took me in her care and sent me to school until I finished my elementary grades. I was able to graduate despite the hardships I experienced. When I was in high school, I was a working student, working for the first parish priest here in Upper Pulangi, Fr. Benny. 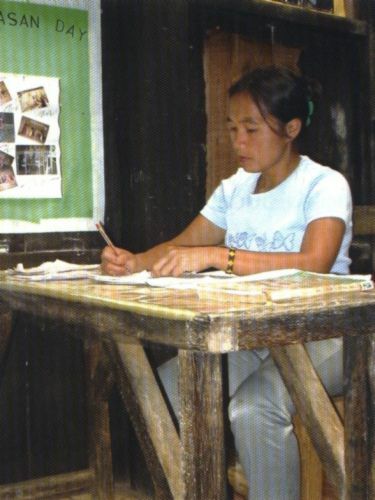 Even before I stayed at the parish convent, I already went through many difficulties in my studies, like the times I hiked from Bendum all the way to Zamboangita, the village where the high school was located. I walked alone for several kilometers, penniless, bringing with me sweet potato, my only provision of food. I tried not to complain for not having a penny and concentrated instead on my journey – but on the road, I started to cry. God may just have been very good to me because once, in school, someone saw me silent and alone in a corner. I was called and given money – I was so happy that time! Some of those who supported me were the father of Roel Compade, presently a student of mine, my father-in-law, and the man who later became my husband. For a half year, I lived happily in the parish convent. After the sixth month, I was transferred to the Sisters’ convent and stayed there. I experienced many adversities, but because I really wanted to study, I persevered until I finished high school. After high school, I stopped studying for some time. I worked in Damulog, also for the nuns. I also endured many difficulties there, and after one year, the Sisters in Damulog recommended me to the Bishop’s House. After five years of suffering and hardships, I was able to finish my studies. On my graduation day, I shed many tears, because I never expected that I would be able to graduate. Several days after graduation, ESSC called me, and invited me to work in Bendum as a volunteer teacher. At first, I declined, thinking, “Why should I return to Bendum? I grew up there. Am I out of my mind?” But I also thought that I needed to go back so that I could help the children who were ignorant and illiterate, and could share with them what I learned. I thought that, yes, people helped me before, so, this time, it is my turn to help people and the children who would like to go to school. I accepted the offer and returned to Bendum. At the start, I had difficulty adjusting to the children because it seemed as if they did not trust me; and also because they knew me and the kind of person that I was. Soon, I was able to win their trust and respect, thank God. A time came when many children stopped attending classes in Bendum. They said that it was because there were no marks. I also wanted to quit teaching, but I encouraged myself. We faced many problems before the Department of Education finally recognized our school. Through the people who supported us, we succeeded. And because of this, I would like to convey my gratitude to all those who supported me before and the people who helped finish school. First, to the Lord, Creator of all. Second, to Pedro Walpole, who has given great help to Bendum. Third, to Eric Bruno, who is still with us today. Fourth, to Ferdinand Hino-ay, who helped me make a strong resolve to continue teaching, and who has worked in Bendum for the longest time. Thank you also to my companions in the past, Kang Sonza (JVP), Bambet Alto (JVP), Ellaine Rodrigo (JVP), Rez Aleria (YOS), Ellen Natividad (JVP), and Rhandy del Rosario (JVP). To the para-teachers, Inak Lailay, who was my adviser, and my partners Ate Nay Cecil, Aunty Daria, Ate Luding, Ate Nay Tugunan, and Rene Aclub. To Louie Bacomo, who worked hard for the accreditation together with Chona Sandoval. Thank you also to the Tribal Council, to the people, and most especially, to the children. I am very grateful because you all accepted me as a person. Also to those who helped me in my education, thank you, because if it were not for your help, I would not have finished my studies. Thank you to Fr. Benny de Guzman, SJ, Mela Caramonte, the MCM Sisters, the Jesuit scholastics and diocesan priests, and most importantly, to Bishop Honesto Chavez Pacaña. To my brothers and sisters, my cousins, relatives and friends, and to my co-workers at present: PJ Mariano (JVP) who put this into writing; Karen Condino, Rene Aclub, and Mary Jane Linsahay (a former staff but who came back to help us again), Jonathan Rizalda and Dante Sinhayan, and the community organizers in Bendum. Also to my family for having accepted my work. I am proud to be a Lumad. Today, as a teacher, I realize that it is good to receive help, but it is better to help. So, for the children, may you continue attending school and make good in your studies. Do not mind the hardships. May you always bear in mind that poverty is not a hindrance to success, and that you are the hope of our country. Do not waste time. I hope those who read this letter will be able to pick up valuable lessons. Thank you so much for taking time to read my letter. May God bless you all.